Shot myself in the foot by digging into all the Uncanny issues. There’s nothing wrong with the stories per se, but I landed right back into Secret Wars II. News flash: the Beyonder is still a chump. That said, I think I’m getting the hang of these characters. As the story opens, Sunspot is in the Danger Room being harassed by Magneto, who is helping him by monitoring and challenging Sunspot’s mettle. He shows those in attendance what he’s got, but with attitude and a bit more mouthing off than he knows what’s good for him (if he were my kid.) He calls off of being a superhero and retreats to the locker room where he gorges himself on cookies. 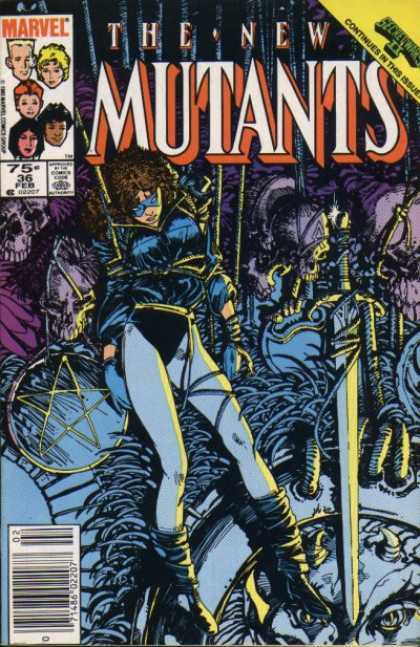 Magick meets up with the Beyonder on the subway and is offered to have her “evil” taken away. Kitty is somehow the new bearer of the soul sword, eldritch armor, and Beatrix medallion. She then fends off some sort of demon in the New York Public Library. In typical Claremont form, he brings up a fun little Ghostbusters quip. Magick then flies a subway car to Xavier’s mansion where she tries her darndest to get her friends to join her. The rest of the New Mutants put up a bit of a fight, mainly revolving around the “greater good” and sparing the life of Kitty Pryde. So yah, getting the hang of these characters…I think. Getting mutant powers and growing up? Then all these issues with a back and forth of trust and different sides of their personalities.